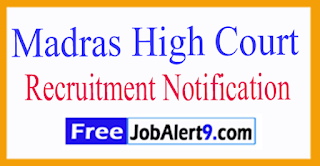 Madras High Court Issued a Advertisement For Recruiting 127 Sweeper, Sanitary Worker.All Eligible And Willing Candidates Can Check Detailed Advertisement From Their Official Website And Apply Offline Before 20-07-2017.Eligible & Interested Candidates Can Check Detailed Information For Each Postion Such As - Eligibility Criteria, Qualifications, Age Limit, Selection Procedure Before Applying. Candidates Maximum Age Should Be Between 18 to 30 years (for Others), 18 to 35 years (for SC/SCA/ST/MBC&DC/BC/BCM) / 01-07-2017. Salary And Grade Pay Scale: INR Rs. 4800 – 10000/- With 1300/- Grade Pay. . Candidates Can Download Application Form Through Official Website (http://www.hcmadras.tn.nic.in). After Filling The Application Form, Candidate Must Send Hard By Copies Of Application Along With Relevant Testimonials Mentioned In Detailed Advertisement To The Following Addressbefor/(20-07-2017). Registrar General, High Court, Madras 600 104 & The Same Shall Reach The Office Of The Registrar General, High Court, Madras 600 104. 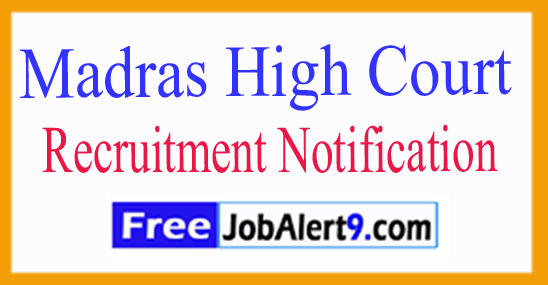 Click Here For Madras High Court Recruitment 2017 Detailed Advertisement.